Published in Montreal Gazette (May 16, 2017). We don't often think about the buildings in which we live, work, learn, eat, shop and play as being major sources of carbon emissions. However, the energy used for heating, air-conditioning, hot water, appliances, equipment and lighting is responsible for 124 million tonnes of carbon emissions per year in Canada or 20 per cent of our country's annual total. To put this in perspective, that's equivalent to the annual amount of carbon emitted by all the vehicles on the road in Canada. Growing awareness of the need to reduce carbon emissions and use energy wisely and efficiently in our homes and buildings represents a golden opportunity. Seizing this chance will spur innovation and demonstrate the benefits of clean growth in Canada's vibrant real estate sector. We're confident Canadians are up for the challenge, and leadership from business and government can accelerate the scope and pace of change. In the Pan-Canadian Framework on Clean Growth and Climate Change, the federal government, provinces and territories pledged to lower carbon emissions by 50 per cent by 2030 and 80 per cent by 2050 - economywide. Buildings were identified as a key vehicle for reducing carbon emissions while growing the economy. Indeed, the shift to low-carbon, low-energy buildings is already happening and along the way it's generating growth in goods and services that has created almost 300,000 jobs nationwide. In terms of direct jobs, the green building sector employs more Canadians than oil and gas, mining and forestry combined. A report produced for Natural Resources Canada in 2014 points out that investing $1 in energy-efficiency programs returns $3 to $5 to the economy. In B.C. 's building sector, we estimate the work ahead entails retrofitting 30,000 houses, hundreds of apartment buildings, and nearly 2,000 office towers, hospitals and schools, and other commercial and institutional buildings per year. Moving alongside this transformation is a growing appetite within capital markets to support green building projects. A major area of growth has been green bonds - such as Ontario's most recent issue - that support LEED-certification projects. In 2016, nearly 50 per cent of TD's green-bond proceeds were allocated to green building projects. Net-zero energy buildings - which generate at least as much renewable energy as they use each year - are an emerging area in green building design. With more than 125 locations generating solar energy, including two branches designed to be net-zero energy, TD has gained first-hand experience in generating renewable energy on-site. Many buildings designed to be net-zero are popping up around the world. Building standards have evolved considerably over the years. The number of units constructed to the world's most energy-efficient building standard, Passive House, has tripled in the past year in North America, with a quarter of these units built in Vancouver. Renovating homes and buildings to meet higher standards of energy efficiency is good for business. A typical example is an office tower in Toronto, in which TD Waterhouse is a tenant. In 2009, it had a major retrofit - from bolstering insulation to updating heating equipment - that resulted in nearly half-a-million dollars in lower annual operating costs and 36-per-cent energy savings. Global cities such as Brussels and New York have put in place progressive action plans to move toward low-carbon, low-energy buildings. 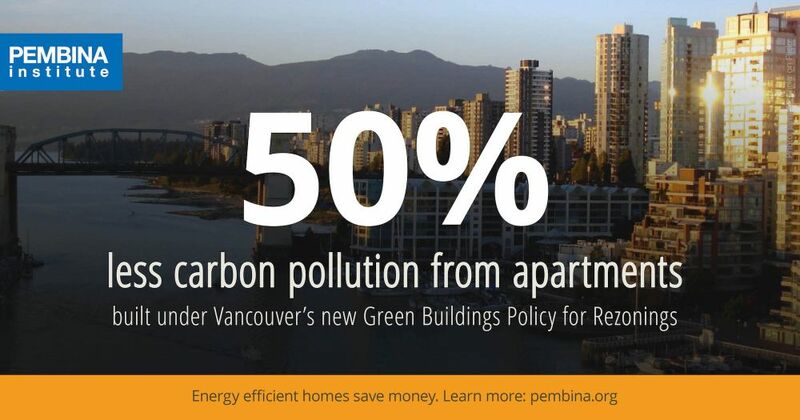 In Canada, the City of Vancouver has brought in a Zero Emissions Building Plan, which will see all buildings become emissions-free by 2030. Vancouver is requiring city-owned buildings to meet this standard immediately. Ontario's Climate Change Action Plan emphasizes retrofitting existing buildings, including public buildings, and installing renewable heating sources. Scaling-up these efforts across Canada calls for a long-term vision and commitment from the government and adequate resourcing of departments to implement programs. This also requires a robust accountability system to ensure that the dollars invested are resulting in real carbon reductions that put us on track to meeting our 2030 and 2050 climate targets. We look forward to seeing the commitments in the Pan-Canadian Framework being turned into action this summer. Specifically, we expect a substantive announcement on the next steps at the Energy and Mines Ministers Conference in August. Much leadership on building energy efficiency has been demonstrated to date, and what is seen as niche now is destined to become the norm. Businesses and governments on the cutting edge of clean growth create important labs and learning grounds for trades and professionals to innovate, evaluate and adapt. These leaders' efforts prove to industry and legislators that these policies are practical and profitable. They also give all stakeholders the confidence to align behind a common goal - securing a strong economy and prosperous future for Canadians. Karen Clarke-Whistler is the chief environment officer of TD Bank Group. Ed Whittingham is the executive director of the Pembina Institute, Canada's leading clean-energy think-tank. This op-ed appeared on page A6 of the Montreal Gazette on May 16, 2017. Tags: National, British Columbia, Federal Policy, Climate Policy, Energy Efficiency, Buildings, Economics.